Corporate Wellness Rewards: Carrot Or Stick? Determining proper reward and incentive structures in wellness programs has always been a challenge for employers. 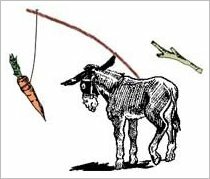 Most commonly, the discussion circles around whether or not corporate wellness programs can deliver better results with the carrot or the stick – the carrot being a reward for engaging in healthy behaviors and the stick serving as a penalty for not engaging in heathy behaviors. Fortunately, a recent study in the New England Journal of Medicine shows the results of the largest test on whether or not financial incentives can lead a person to better health. The test, which was conducted on a large group of CVS employees, focused on smoking cessation and offered a surprising insight to human behavior. With a reward offered for quitting smoking, many more employees signed up for the program, but only a small portion (17%) actually quit smoking. A far smaller number chose to risk the penalty, but those you did were twice as likely to quit. Specifically, the penalty program required participants to make a $150 deposit that would be forfeited if that person failed to remain smoke-free for six months. “Adding a bit of a stick was much better than a pure carrot,” said Dr. Scott Halpern, deputy director of the Center for Health Incentives and Behavioral Economics at the University of Pennsylvania School of Medicine. These new findings will help guide employers as they structure incentives for their corporate wellness programs. With large employers spending an average of $800 to $900 per employee per year on wellness, it will be important for them to recognize that the carrot may drive participation, which is crucial, but combined with a stick, employees are more likely to change their behaviors. CVS is planning to take the findings from the study to design a smoking cessation program for its more than 200,000 employees.